August 5, 2013 - Leading international wildlife experts, airport operations professionals, regulators, and other aviation industry representatives will gather August 12-15 in Milwaukee at the 2013 Bird Strike North America Conference to discuss the latest advances in keeping wildlife away from aircraft. The meeting, produced by Bird Strike Committee USA/Bird Strike Association of Canada and the American Association of Airport Executives (AAAE) and hosted by General Mitchell International Airport, is designed to share the latest information, best practices and training to help airports and operators mitigate the risks posed by the combination of aircraft and wildlife. Delegates will hear from experts representing all stakeholders, including wildlife biologists, airport operations executives, pilots, regulators, and suppliers of tools and systems designed to mitigate wildlife strike risks. "Airport operators have a responsibility to ensure that all appropriate actions are taken to mitigate the potential for bird and wildlife strikes at their facilities," said John Ostrom, manager of Airside Operations at Minneapolis-St. Paul International Airport and chair of Bird Strike Committee USA. "This meeting and the training, education and information exchange it provides is one of the ways Bird Strike Committee USA and /Bird Strike Association of Canada help airports meet this responsibility." Wildlife strikes have been a major concern in aviation for decades. 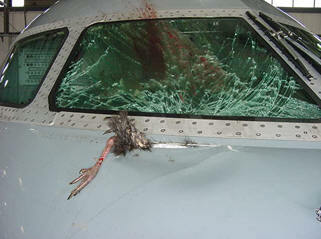 In 2012, the U.S. civil aviation industry reported more than 10,700 wildlife strikes, most of them involving birds. Strikes cost the industry an estimated $743 million per year in damaged aircraft, irregular operations and other consequences. The problem impacts the military as well. In 2012, U.S. Air Force aircraft were involved in more than 4,000 wildlife strikes. The keynote address will be delivered by Mont Smith, the former Director of Safety for Airlines for America and a former military and commercial aviation pilot. Mont has a long interest in the impact of wildlife strikes on aviation safety and was instrumental in recent efforts involving the Commercial Aviation Safety Team decision to more intensively monitor the wildlife strike issue. Bird Strike 2013 is a must-attend event for military and civilian personnel responsible for airfield operations, wildlife and wetland resource managers, land-use planners, FAA inspectors, university researchers, engineers, pilots, aviation representatives, waste management operators and anyone interested in mitigating wildlife strikes.